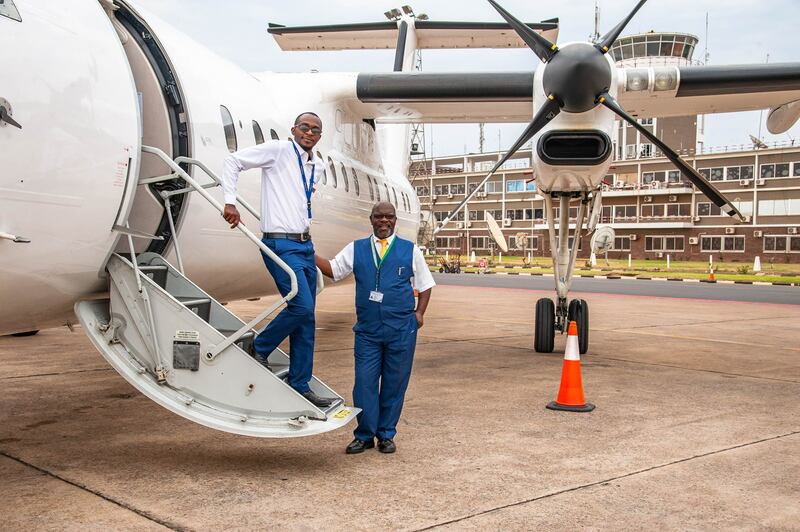 The national pride of Zambia’s leading airline reached new heights as the airline celebrated Independence Day with the inaugural flight of its new 50-seat Dash 8-300 aircraft. Dignitaries from the Ministry of Transport and Communications, Zambia Airports Corporation, Zambia Civil Aviation Authority, media and staff joined the plane’s first flight over Lusaka to celebrate the country’s 54th birthday. The aircraft, which is being registered in Zambia, has been named Independence – and Ubuntungwa in Bemba – to mark the occasion, and in recognition of Proflight’s 27 years as an independent Zambian-owned and operated airline. Meanwhile, Zambia Airports Corporation Director of Airport Services Agness Chaila said: “The inaugural flight on the Dash 8 was perfect, I liked the spaciousness of the aircraft, it was comfortable. As Zambia Airports we are very happy with this development. Proflight’s Director of Government and Industry Affairs Capt. Philip Lemba welcomed the passengers aboard the Dash 8 with a champagne toast to Zambia’s 54th anniversary. “We are very happy to have the Dash 8 join our fleet. As Proflight we continue to take pride to fly across the Zambian skies with a magnificent fleet of aircraft and team. The Dash 8 inaugural Independence flight is dedicated in celebration of Zambia’s 54th independence anniversary with the theme “celebrating a shared future of unity, development and prosperity”. Proflight’s naming of the Dash 8 as Independence follows the theme started with the naming of its CRJ aircraft Chembe. Proflight’s strategy of investment in bigger planes such as the Dash 8-300, built by Canadian aircraft manufacturer Bombardier Aerospace, propels the Zambian-owned and operated airline into the league of top-tier regional airlines operating the dash 8, which include Ethiopian airlines, QantasLink, Flybe, SA express and CemAir in South Africa. Capt. 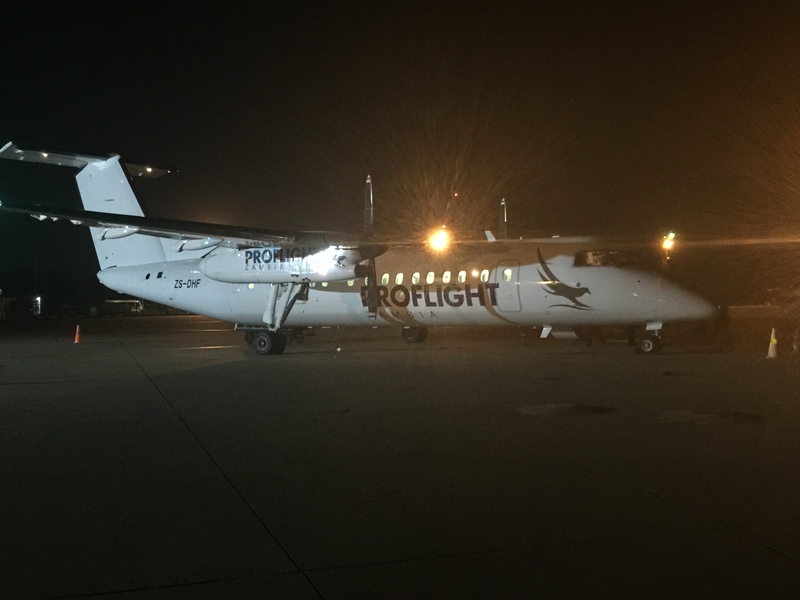 Lemba stated: “With our commitment to offer world-class flight services, Proflight’s Dash 8-300 will be efficient and reliable in servicing our domestic and regional routes. “The aircraft coming from the Bombardier family will bring more choice and greater value to our customers,” he added. The new 50-seater dash 8 aircraft now brings Proflight’s total fleet number to seven aircraft, and the promise of more convenience and more destinations. Proflight Zambia was established in 1991 and is Zambia’s leading scheduled airline. From its base in Lusaka its domestic routes include Livingstone, Mfuwe, Lower Zambezi, Kalabo, Ndola, Solwezi, Kasama, Ndola-Solwezi and Ndola-Kasama, and regional routes to Lilongwe in Malawi, Durban in South Africa, and Harare in Zimbabwe. @Advocate, that’s what it means to have a upnd spirit, everything is bad. It’s like having a spirit of witchcraft. Don’t just join these political parties you will end killing people with jealous. plane is 30 years plus…..
Oh! another small Mickey Mouse aircraft added to the fleet when others in the region are buying Dreamliners and A380s. That’s great. So you want them to fly an A380 from Lusaka to Livingstone or Lusaka to Mfuwe. You are sick …..
Advocate you have been diagnosed with pull-me-down syndrome. Grow up and learn to support others. An increased capacity of even 1 passenger is welcome, let alone 50 multiplied by the number of flights per day. Don’t be petty and give praise where its due. Unless you and your dad have the Dreamliners you are yupping about in your back yard! Just free advise for your sake. Airbus is discontinuing making Airbus A380 because there are no customers for it. If Emirates wont place the 100 A380 order with Airbus, thats the end. As always, ba UPND you claim to be educated when in-fact its the opposite. Be factual, thats why you keep losing elections for ever and ever. Free advise from PF!!!!!! I’ve just flown in this plane, it looks pretty old to me…..definitely not new. Zambian reporting. Planes are known by their manufacturer. Bombardier dash 8 – 300 is the standard name of this aircraft. The manifacturer is put in front always. Nice but we need turbojet engines now. While turbojet engines are most efficient at high speeds and high altitudes, and propellers are most efficient at slow and medium speeds we need more jet engines. Well done proflight. We look forward to the day you buy your first jet propelled aircraft. Razar- the Bombardier Aerospace, CJR “Chembe” is a jet that they own do your research first before you write. Interestingly if you look at the photo the registration number on the tail is South African, so its not even on the Zambian books. are leased from South African Airline CEMAIR that explains the SA rego of the aircraft. Yes this plane was built around 2004 as they stopped making them in 2009 and started the 90 seat 400 series. next time you fly as you enter on the right is a small silver VIN plate (if you look at the photo above it is parallel to the guys head on the steps on the door frame) that gives the year of manufacturer . A new 400 series one is $32 million US more than Zambian airways total investment budget but they are not flying anything more than paper airplanes. Canadian planes are safer than Russian!!!!!!! !